Calgary, Alberta, the land of cowboys, the Rocky Mountains and tax-free opportunity! Are you looking for an apartment to rent in Calgary? This beautiful city lies in an area of foothills and prairie at the crux of two rivers in Southern Alberta. Today could be your lucky day. 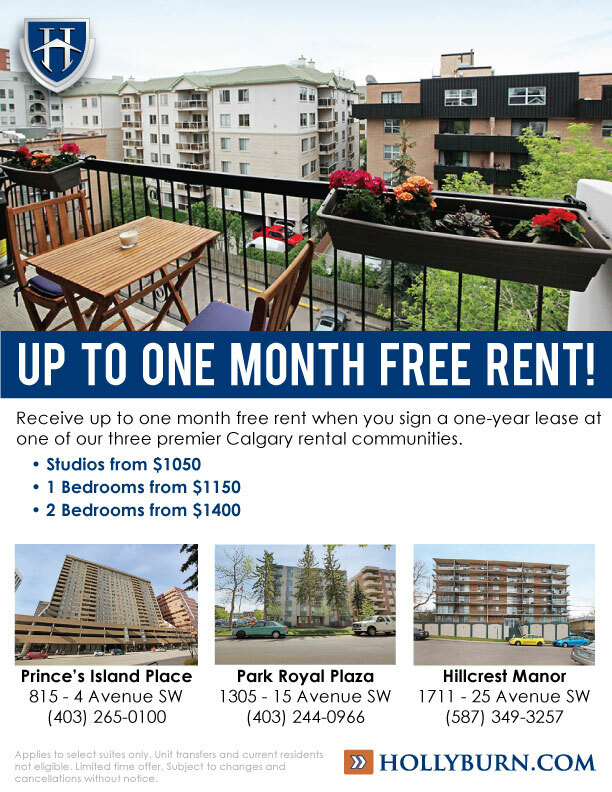 Hollyburn Properties has three premier Calgary rental apartments with availability for July and August 2015, and we’re offering up to one month FREE RENT! Imagine what you could do with the savings… Plan that trip you’ve been thinking about, pay off some debt, or invest in a Tax Free Savings Account. The options are endless. Just get down here and find your new dream apartment! Studios available from $1050, 1 bedrooms from $1150 and 2 bedrooms from $1400. For more information or to view a suite, please contact the building manager.